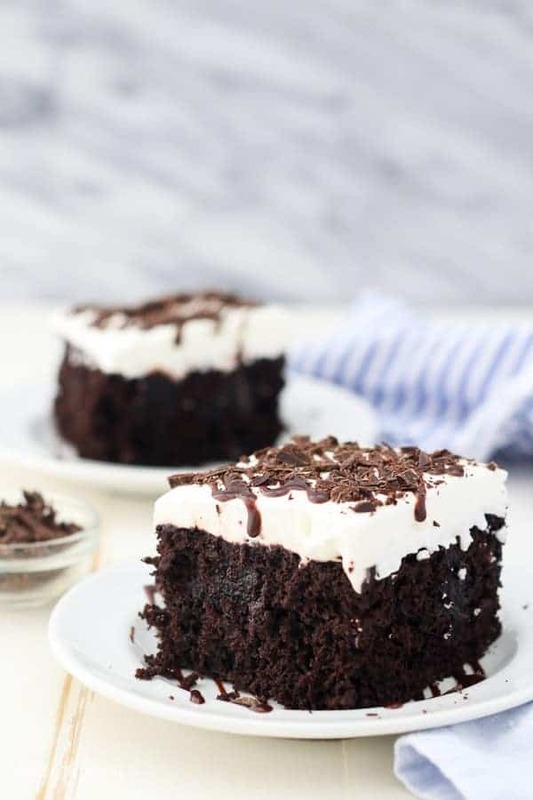 This Easy Chocolate Poke Cake is a mouthwatering chocolate poke cake from scratch, soaked with chocolate pudding and a homemade whipped cream on top. 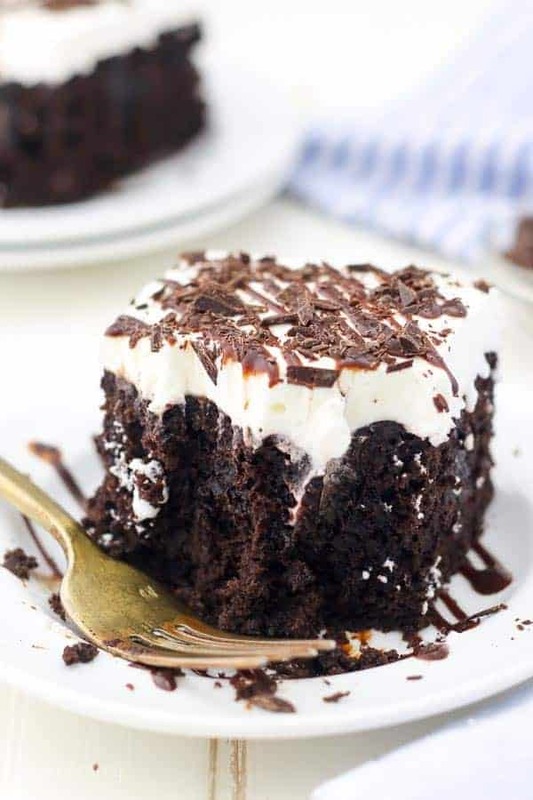 You’ll love the moist chocolate cake, it’s a light and fluffy cake but once you add the pudding, it’s simply irresistible. You can never have too many poke cake recipes in your pocket- and that’s in part due to the endless flavor combinations! I should know, I have dozens of poke cake recipes! 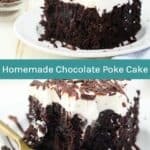 Up until recently, a lot of my poke cake recipes were made with cake mix, but I’ve been adding more and more cake recipes from scratch and updating older poke cake recipes with options to make them from scratch. What is a poke cake? 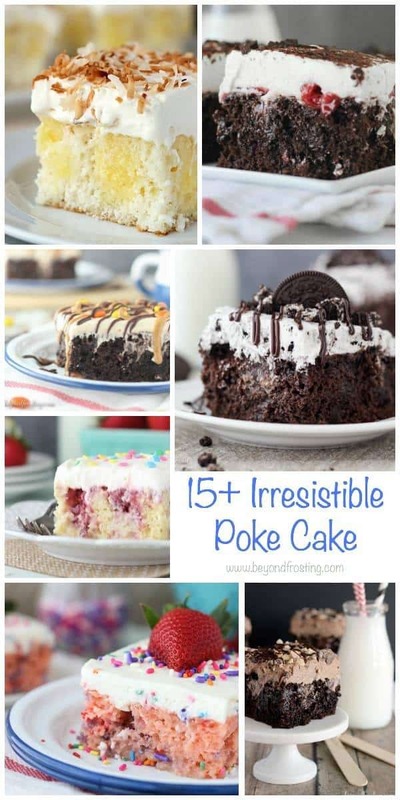 A poke cake is cake made traditionally in a 9×13 inch pan and once it’s baked, you take the end of a wooden spoon and poke holes all over the top of the cake. Then, you pour your liquid filling over top of the hole. The most commonly used fillings are either pudding or sweetened condensed milk. If you’ve been looking for a poke cake recipe you can’t live without, look no further. 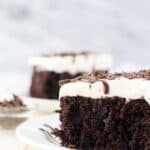 I recently made my super moist chocolate cake recipe, I knew immediately that a homemade Easy Chocolate Poke Cake would be next in line. 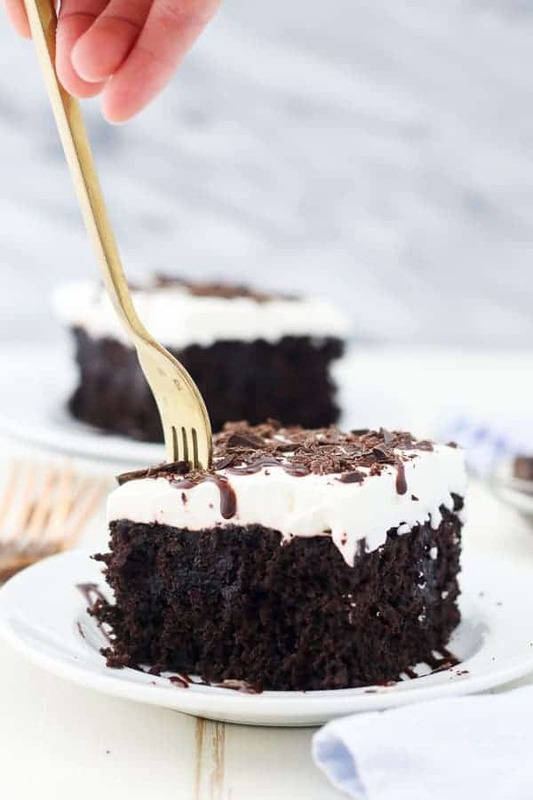 This light and fluffy, homemade chocolate cake is soaked in chocolate pudding and topped with a homemade whipped cream. 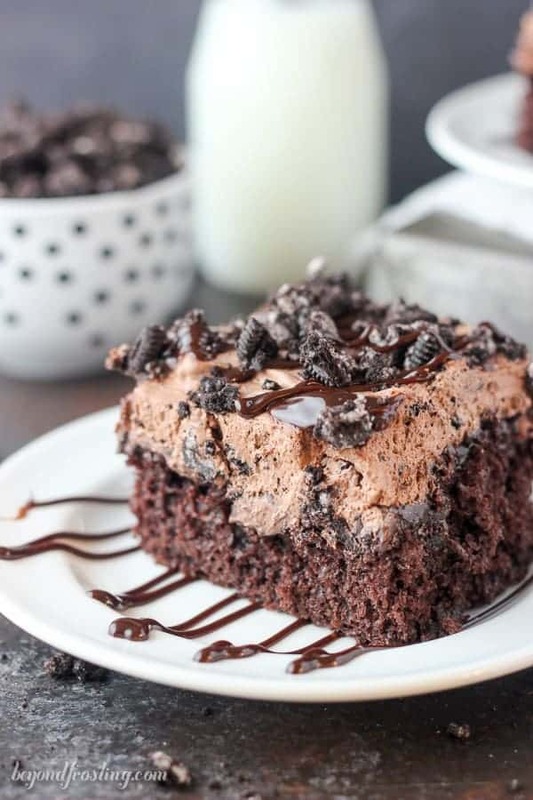 How to make this easy chocolate poke cake recipe? The cake itself is very easy to make. It’s an oil-based chocolate cake, so there’s no waiting for butter to come to room temperature. The oil is mixed with eggs and sugar and beaten until well combined. Then you add the sour cream, I use light sour cream which helps adds to the moisture and texture of this cake. I get a lot of questions about substitutes for the sour cream. I would recommend substituting with nonfat Greek yogurt if you do not have sour cream. I do not recommend omitting it completely. Then the dry ingredients are mixed together with coffee. The coffee definitely helps bring out the chocolate flavor in this cake. If you do not want to use coffee, then I suggest using water. There are plenty of options you could do to customize this cake such as changing the flavor of pudding or the topping. How do you make a poke cake with instant pudding mix? I get lots of questions about using pudding with my poke cakes. The pudding mix should be prepared once the cake is baked, cooled and you have poked your holes. In a bowl, combined the milk and the instant pudding mix. Then, before the pudding mix has hardened or set, immediately pour the liquid pudding mix over the cake and then allow the pudding to set in the fridge until its firm (about 10 minutes or less). Finally, you need to pick a topping for your poke cake. 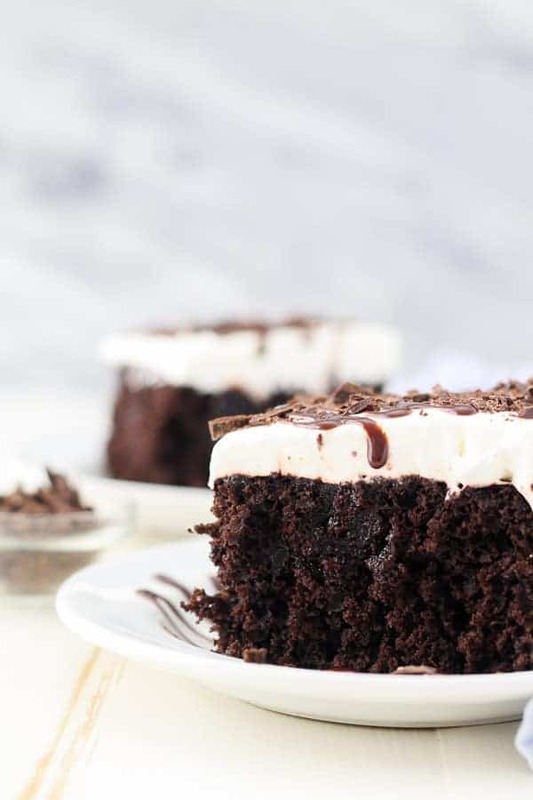 Even though I love whipped cream, this would also be a good opportunity to use hot chocolate whipped cream, which is what I used for my Triple Chocolate Poke Cake. 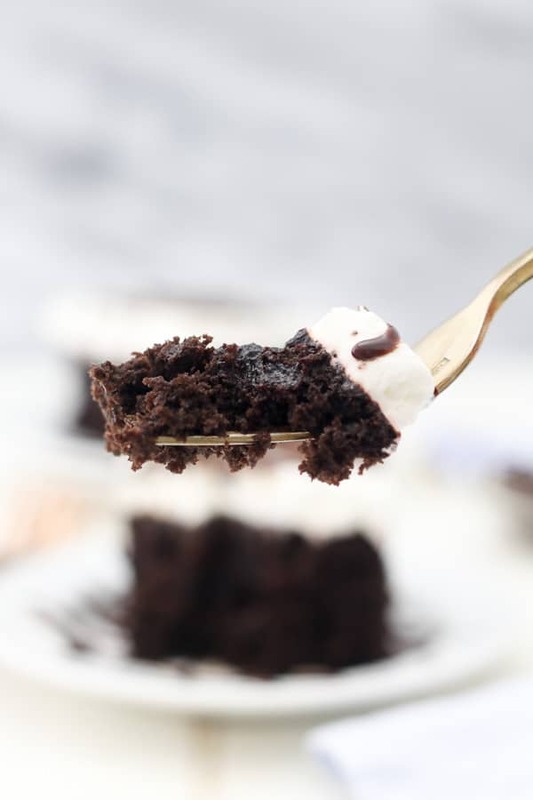 There are several ways you can garnish this Easy Chocolate Poke Cake. You can serve it with fruit, chocolate shavings, crushed cookies, hot fudge sauce, sprinkles or anything in your pantry really. It’s up to you- and I just love seeing your creativity! 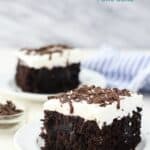 This Easy Chocolate Poke Cake is a mouthwatering chocolate poke cake from scratch, soaked with chocolate pudding and a homemade whipped cream on top. In a large mixing bowl, combine the sugar, vegetable oil, eggs and vanilla extract. Beat on medium speed until the eggs and oil are well incorporated and the batter is lighter in color. Next mix in the sour cream and beat until well combined. In a sperate bowl, sift together the dry ingredients. Then add half the dry ingredients followed by half of the coffee and mix just until the flour starts to incorporate. Finally add the remaining dry ingredients, mixing on low speed while pouring in the remaining coffee and beating until all of the ingredients are well combined. Use a spatula to scrape down the sides of the bowl and stir the batter from the bottom to the top to ensure it’s well mixed. Pour the batter into a 9×13-inch pan and bake at 350°F for 26-28 minutes. Test the cake for doneness by inserting a toothpick into the center of the cake. If the toothpick comes out clean, you cake is done. Remove from the oven and allow to cool completely. Take a wooden spoon or another round object and poke holes over the top of the cake. For the filling: In a small mixing bowl, combine the instant chocolate pudding with the milk and whisk together until the powdered mix is dissolved. Pour the liquid pudding mix over top of the cake, try to fill the holes with the pudding mix. Refrigerate the cake until the pudding is firm, about 10 minutes or so. Pour the heavy whipping cream into the chilled bowl and use an electric mixer to beat the heavy cream on medium-high speed until the cream thickens. Slowly add the powdered sugar and continue beating on high speed until stiff peaks start to form. Spread the whipped cream over the top of the cake. Keep refrigerated. Serve with hot fudge sauce and chocolate shaving or chocolate sprinkles. Hi – looks so good! My kids want to make it this weekend. Could you leave out the coffee? Would you add in any other liquid? You can substitute milk or hot water for the coffee. Enjoy! I made this for a small party with friends. The cake was loved by everyone. Many ended up having more than one piece! The only difference for me was that I added 2 more tablespoons of confectioner sugar to the whipped cream and a few drops of vanilla. Amazing cake! Thank you. That is wonderful Jessica!! Thank you for sharing! First of all, this cake is stunning in appearance. So rich and dark looking. And with coffee flavors, I must give this one a try. Pinning. Thank you SO much Lea Ann!